The U.S. has experienced a prolonged period of economic insecurity, which is impacting many communities, families, individuals and even our institutions. Poverty is steadily increasing while economic opportunities are on the decline. At the same time, income and wealth inequalities are widening. As these signs of economic instability grow, many troubling barriers to opportunity are devastating marginalized groups. Meant to be the great engine of equal opportunity, our education system is growing more racially and economically segregated, transferring and expanding inequality across generations. Predatory lending, an uneven credit market, depreciation in the housing market and foreclosure are reducing the utility of housing in stabilizing personal finances and neighborhoods. Although many of these issues first appeared in communities of color in inner cities, they are now well known on Wall Street, and threaten both low- and middle-income families. The ability to remain healthy in American society is threatened by a surge in uninsured people and rising health care costs. As with many of the challenges facing our society, marginalized communities – racial and ethnic populations and the disadvantaged – are disproportionately burdened. These new challenges should embolden our efforts to address poverty and promote access to opportunity in the U.S. and across the world. How can philanthropic organizations make transformational investments to eradicate poverty and social exclusion? As challenges grow, resources to address economic insecurity will be stressed, requiring effective strategic investments that can increase opportunities for individuals and communities. 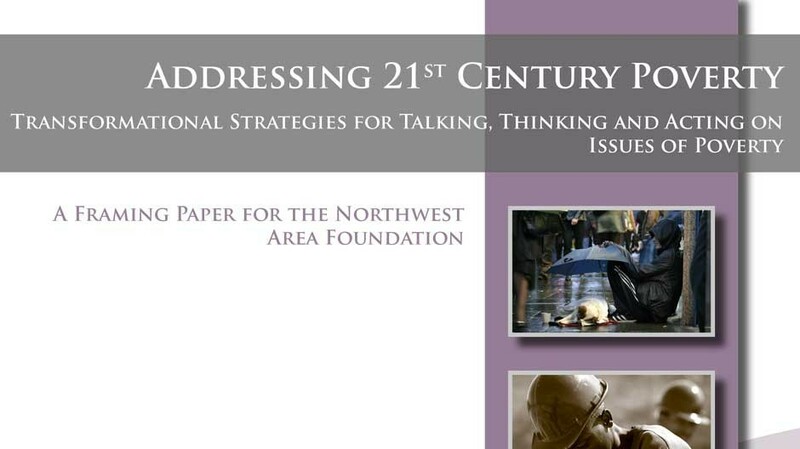 This position paper offers new and insightful ways to talk, think and act around poverty and race that can impact the NWAF agenda. Addressing the economic challenges of the 21st century will require us to reframe the discourse on poverty and change how we “talk” about critical policy solutions. Our ability to transform the future of economically marginalized people and communities requires building broad public support for expanding access to opportunity. We also must change how we “think” about solutions to address poverty. Poverty is a symptom of a broader disease, the structural arrangements that deny access to opportunity, wealth and power for marginalized groups, while limiting opportunity for the non-poor as well. Instead of focusing on welfare models of poverty reduction, we must first understand the critical structural arrangements that produce poverty and increase the anxiety and stress in the middle class. Finally, we must “act” more deliberately and strategically to locate the precise interventions and leverage points needed to expand opportunity for all. Our growing economic insecurity presents one of the greatest challenges to the future of our communities and our nation. Only a society, which allows for true membership can be a truly functioning and representative democracy. By assuring access to opportunity for marginalized groups, we expand opportunity for all.